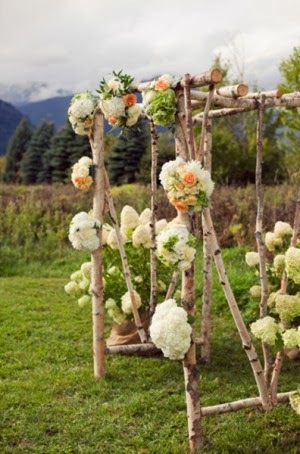 Wedding arches with flowers is one of many wedding flower arrangement ideas that is worthy of your consideration. 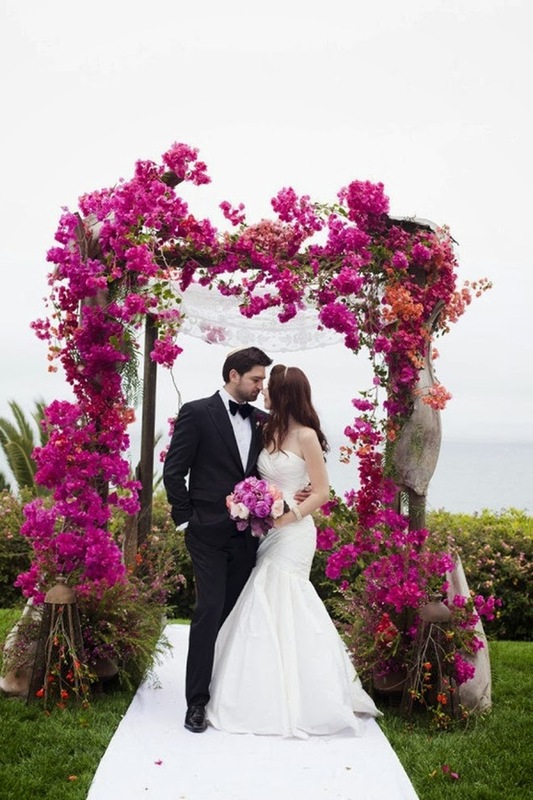 There are actually many attractive options for using these arches, both with styles of arches and flower applications. 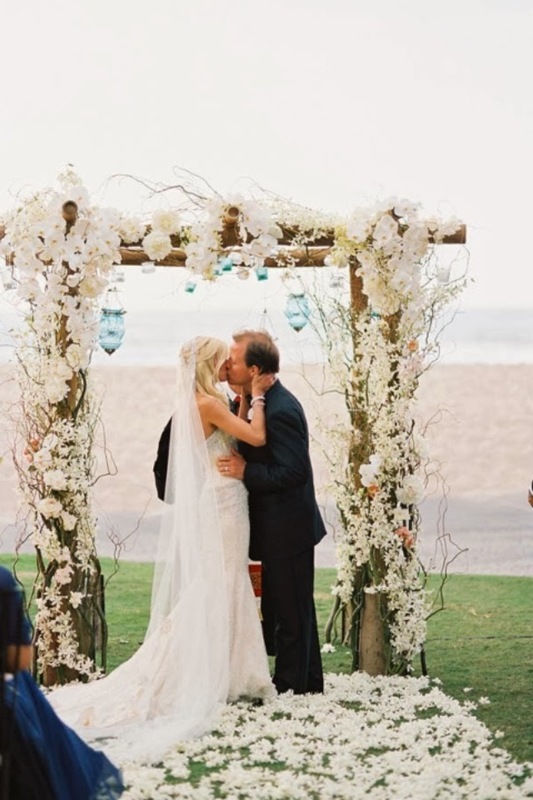 Arches appear in many architectural designs and are a great way to take advantage of the structure to enhance the wedding. Many churches have arches over the front door or along a walkway and some have arches inside. 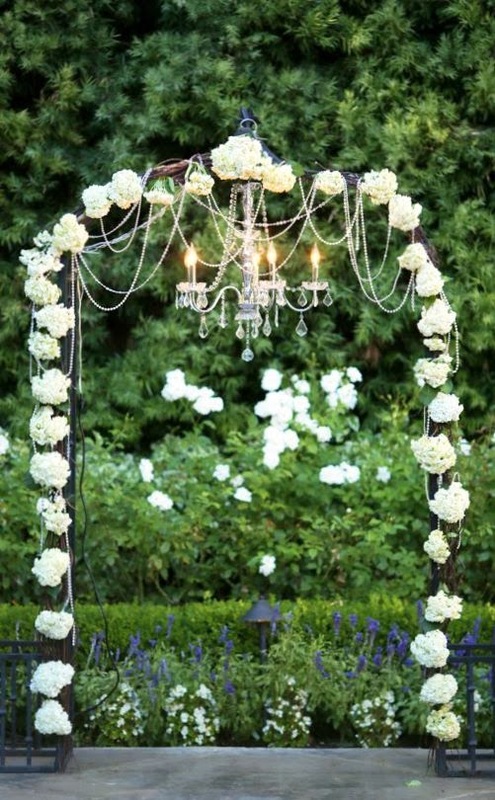 Garlands of greenery with or without flowers are lovely ways to enhance the beauty of these details. 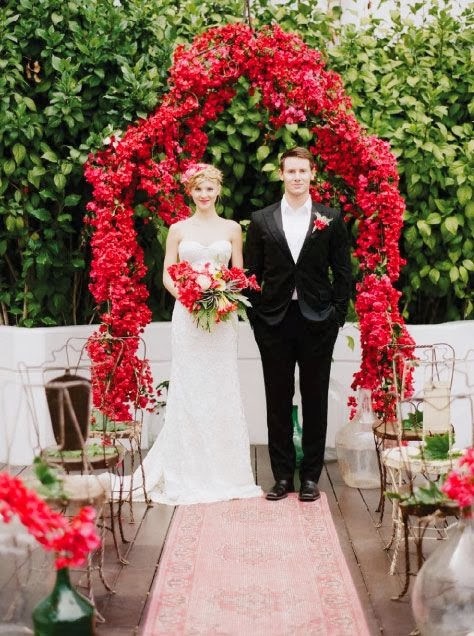 Architectural arches in buildings make great backdrops for outdoor weddings. Some public formal gardens have arches carved in tall shrubbery. What an ideal setting for a wedding. Fresh flowers can be added for an awesome display. Roses and climbing hydrangea are often grown on wooden or metal arches. If you have enough time to plan well in advance, a potted plant can be trained on an arch and moved to another location for the wedding. When trees are planted across from each other, they can grow together to form a natural arch. So be aware of the lovely settings that we sometimes overlook when planning an outdoor wedding. Wooden pergolas make wonderful structures to grow climbing vines such as wisteria, honeysuckle, roses, and passion flowers. 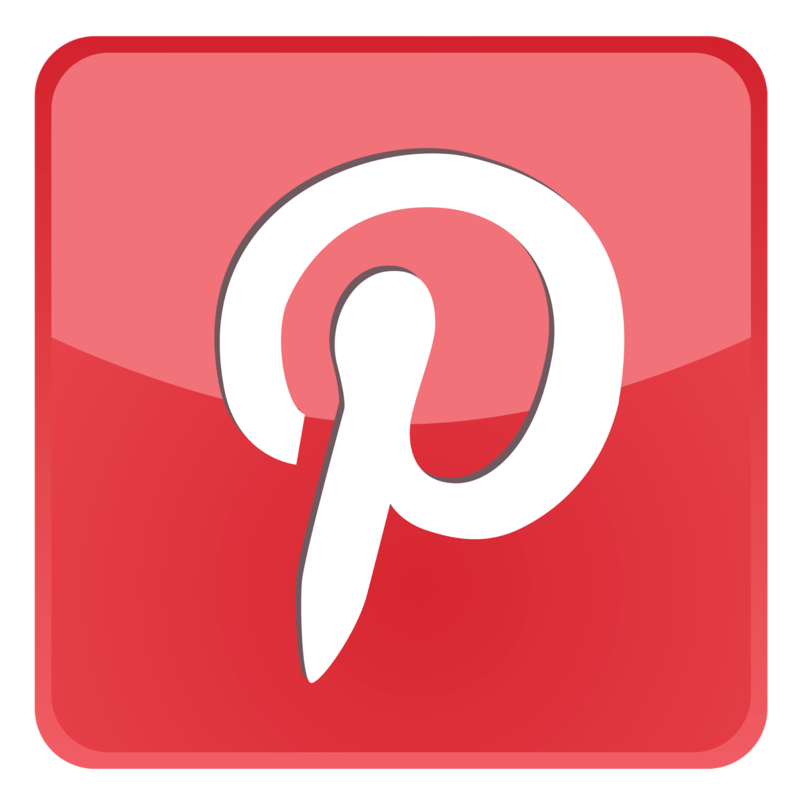 With a little planning, you will have a lovely natural and inexpensive backdrop for your wedding. Smaller arches can be purchased at a garden supply store. They are light weight and easy to decorate. They can be used to train vines and flowers to grow on or cuttings of ivy or boxwood can be wired in place to cover the arch for a beautiful wedding accent. Flower arrangements really enhance all green arches. They can be as simple as a few roses scattered throughout the greenery or large showy arrangements made in florist containers and attached to the structure. Boughs of gardenia, magnolia or camellia are simple ways to enhance arches and a great price too. 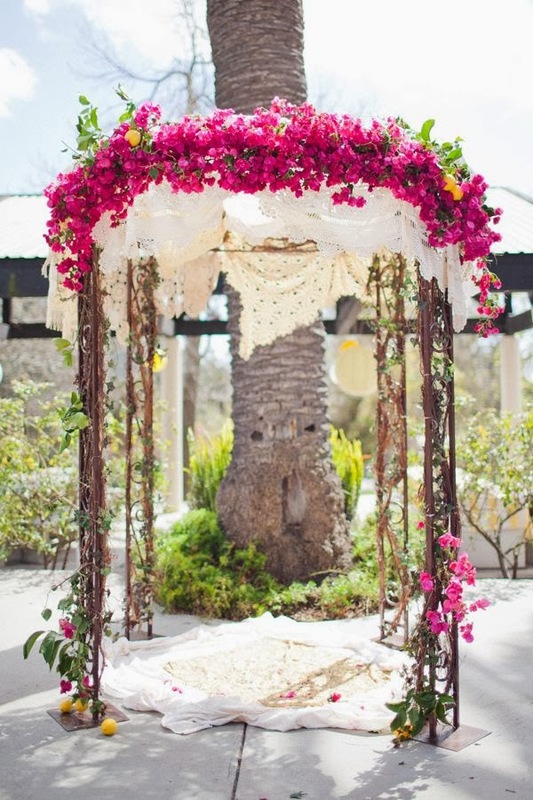 If you wish to create your own arch with greenery, a simple way is to use a rope and attach greenery and flowers. It does take a little time, but it is a huge cost saver for a DIY project. Another fast and easy way is to staple sprigs of greenery directly to a wooden structure. Be sure to submerge the branches in water for several hours to hydrate them. This will keep them from wilting for several days. If the arch will be in full sun, be sure to mist it to keep it fresh. A flower preservative is a liquid mixture used by florists to extend the life of flowers and greenery. It is available at floral supply stores and florists and will ensure fresh, lush flowers and greenery for your wedding. To make an ivy "garland" to cover an arch, measure and cut a rope to fit the shape of the arch. Cut sprigs of ivy about six to eight inches long and wire them onto the rope. Start at one end and place the sprigs around the end of the rope. Wire in place. Start the second row a few inches below the first row, but overlap the ends of the sprigs to cover the wire. Flowers can be added after the ivy is in place. Attach the rope garland with wire or staple in place. 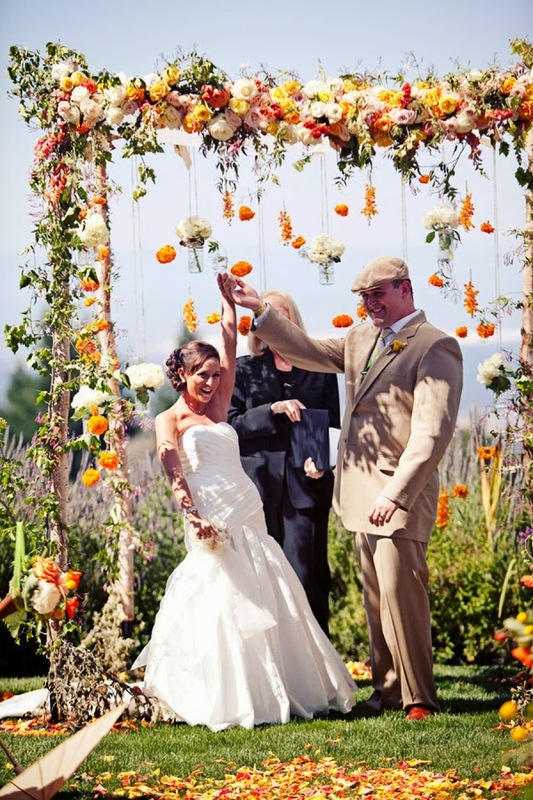 Flowers can be added to arches in several different ways depending on how many you will be using. If you want a large arrangement, it is best to use floral foam containers to hold the flowers. There are a variety of containers available. Berry baskets are great to use and can be taped, wired, or stapled to a frame. They are inexpensive and make great holders for floral foam. The grid shapes also help when designing the arrangements. The baskets can be used alone or in groups for a large arrangement. Arrangements in floral containers can be rested on top of an archway and secured with florist tape or wire. As you can see, there are numerous wonderful possibilities when using wedding flowers with arches. When used tastefully as a complement to your overall design you will be delighted with the results.